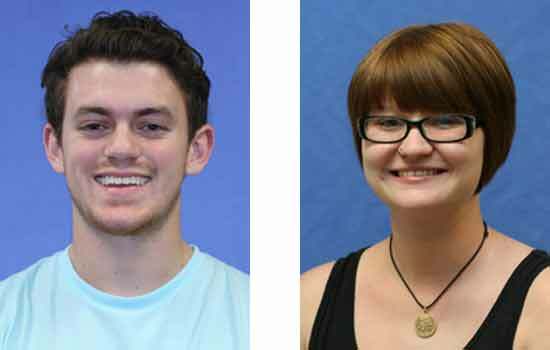 Two undergraduate students in Rochester Institute of Technology’s College of Science have won awards from the Barry M. Goldwater Scholarship and Excellence in Education Program. Alexander Triassi and Taylor Barrett will receive $7,500 for their senior years at RIT. They were among 283 sophomores and juniors selected from 1,166 nominees. The Goldwater Scholarship is considered to be one of the most prestigious awards given to undergraduates committed to pursuing careers in mathematics, the natural sciences or engineering. Triassi is a third-year biotechnology major from Henrietta, N.Y., and a member of the RIT’s Honors Program. He conducts research with André Hudson, associate professor in the Thomas H. Gosnell College of Life Sciences. His research involves the discovery of potentially novel antibiotic targets in pathogenic bacteria and the discovery of new bacterial species. He is an author on two scientific peer-reviewed journal articles and will present his research at the American Society for Microbiology National Meeting this spring. Triassi will spend the summer at Massachusetts Institute for Technology as an Amgen-Undergraduate Research Opportunities Program Scholar. Triassi is also a past recipient of the John Wiley Jones Outstanding Student in Science Award and an RIT Presidential Scholarship. He has served as a College of Science Ambassador and an Insight Lab Family Science Leader, and has participated in the RIT National Society for Leadership and Success. Triassi has sat on the Isaac L. Jordan Student/Faculty Pluralism Award Selection Committee and on the Honors Program Freshman Orientation Mentor and Housing Committee. In addition to being an active RIT community member, Triassi has helped rebuild homes for Hurricane Katrina victims through the Livingston CARES Mission Project. Triassi intends to pursue his Ph.D. in microbial biochemistry and to influence future generations of scientists through research and mentorship. Barrett, a third-year chemistry major from Middletown, Pa., has conducted research since her freshman year. She has created peptide scaffolds for targeted multi-modal imaging agents with Hans Schmitthenner, research scientist in the RIT School of Chemistry and Materials Science, and has presented her work at the Rochester Academy of Sciences and the World Molecular Imaging Congress. Her awards include an RIT Merit Scholarship, RIT School of Chemistry and Materials Science Outstanding Sophomore Award, two RIT Summer Fellowships and a World Molecular Imaging Congress travel grant. Barrett is a member of the RIT Honors Program and is an RIT Chemistry Research Scholar. She is an active community member who has served as secretary for the House of General Science, as a peer adviser for RIT’s Year One Program, an orientation assistant and operations manager for New Student Orientation, and as a teaching assistant for Quantitative Chemical Analysis and Chemical Separations. Barrett plans to earn her Ph.D. in bioorganic chemistry and pursue a career conducting research in biomedical imaging or drug targeting and teaching at the university level.